Some people really love Christmas. And they share their holiday spirit and Christmas cheer by going all out this time of year. Some of us can’t help it. We have to have the biggest, or the most, or the coolest thing out there. Some of us have to be different even for Christmas. Or maybe we’re “collectors” and we’ve got an attachment for Christmas flavored stuff. Anyway, here are some stories and pictures of people who dare to be different this time of year. These folks sure are festive and spend a good amount of time and money to prep for their short time in the spotlight. To them, the trouble and the spending are no object. They will always have a budget for this sort of thing 🙂 . This is a photo of a small part of a Christmas tree lodged in someone’s house. 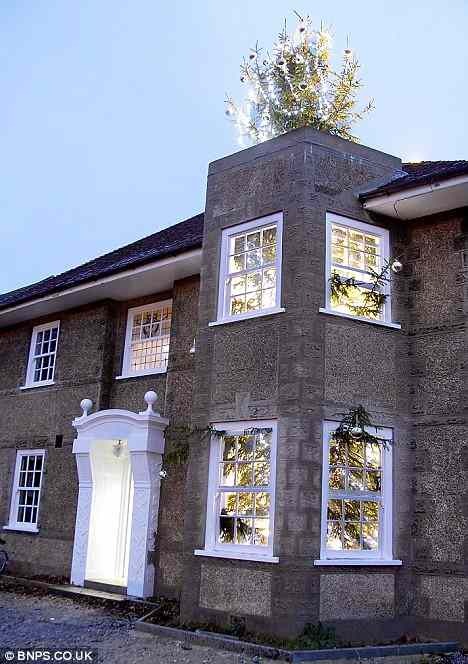 Greig Howe’s house, in fact, in Bournemouth, Dorset, England. Yes, this was done on purpose. 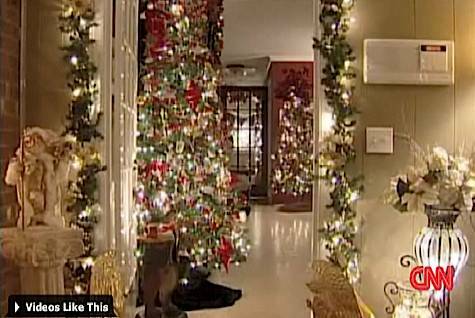 This family’s Christmas tree is sky’s the limit, giving the illusion of passing through all three floors of the family home. That’s a lot of work and decorative alterations to accommodate this monster for a few weeks of “wow”! Plus where the heck do you find a tree that huge? I guess in the same place that department stores do. Greig paid the equivalent of $360.00 (around 250 pounds) for the tree, then covered it with 2,000 LED lights, 160 ornaments and a lovely tree-crowning star. They have to be everywhere. She’s not the only one collecting trees — here’s yet another lady with 37 trees, and this one with 27 trees. Just be careful of the potential hazards that this type of scene may present. 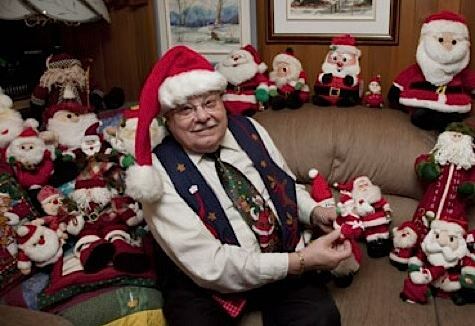 While women collect Christmas trees, how about this guy who collects Santa Claus (or Father Christmas, in some parts of the world) figurines and decorations? If you’re big on Santa, you’ll have to check this site. As for me, well, I’ve gotten into the collectible spirit myself a little bit by building my own Christmas ornament collection, a hint of it you’ll see in this post on money, finance and fancy. And as far as the holiday spirit goes, we can do pretty much anything to celebrate and share it, except maybe by making a statement with a collection of these ornaments (click this at your own risk)! Christmas is probably one of my favorite holidays because it brings the family closer together and it is also a time for giving to those who are less fortunate than you are. That is one massively tall Christmas Tree! I dont even want to know how they got it in there. Now that is nuts! I can’t imagine how long it takes to pick up all the needles! On a tangent, if you are going shopping for some deals tomorrow, check out this post. Merry X-Mas and happy Holiays to everyone at TDL! Wow !! 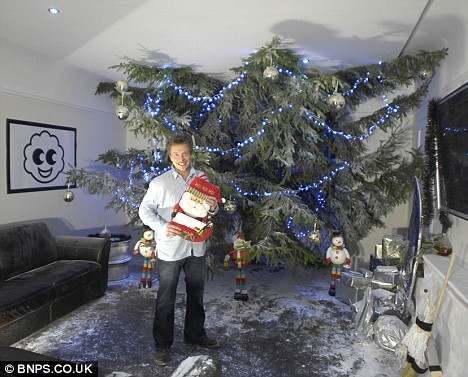 This guy has taken the whole Christmas tree thing to a whole new level. Gotta admire his effort. Glad to see he got some recognition for his efforts. That two story tree is awesome. I just wonder what they do if it rains. I guess if snowed that would actually be pretty fun for the kids. To open presents in the snow. Don’t use just love us mad eccentric Brits…where else in the world???….. Such wonderful pictures. With another 68 days to go before Christmas, I’m feeling that Christmas spirit gushing down my gut already! Have a great season everyone. Interesting article. Some people just like the Christmas spirit and want to enjoy it all year through. With their collections they succeed in that. This is so nuts! I love Christmas, but I can’t see spending that much for a crazy number of decorations. If I absolutely -had- to be one of them it would be the Santa collector… unless it got too creepy with them all staring at me. Chocolate Easter Eggs With A Twist!